is well-known in the Nigerian movie and entertainment industry as a Producer/Director, but prefers to hide behind the camera. Temitope Duker, who partners with her husband, Fidelis Duker, is the brain behind the annually held Abuja International Film Festival. 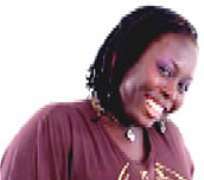 The mother of three, though very shy, in this chat with SANDRA-IZUU OKAFOR speaks of her life, her career and family. You recently produced and directed a TV reality show for children called 'Kids Alone', why Kids Alone? Kids Alone is basically our own contribution to the growing need for children entertainment in Nigeria. We (myself and my husband, Fidelis) discovered that children programming has since been on a decline on Nigerian TV and we felt there was a need to create an entertaining, educative and enlightening programme that would offer our children a pride of place. Because, apart from being an entertainment show, the children would be enlightened and educated more on things that will enhance their academic, moral and social endeavours. What inspired this, or is it just to add to the number of reality show programmes? Yes, I think you might be right if you say it's another addition to reality shows but it certainly goes beyond the addition. We discovered most of the reality shows around the world are targetted at the older generations and in some cases, teenagers, but none serves the yearnings of the younger ones, I mean children. I was watching one of these reality shows with my family (my children and husband), and the idea struck me when I discovered that for lack of children's programmes, my children were watching a show meant for those above 14 years and the oldest of my childen is just ten. So, we wanted to stop them from watching but realistically, apart from cartoons, you can count the indigenous children's programmes on your finger tips. That was where the idea to create Kids Alone started. Will this continue or is it a one off project? Of course not! I have never started anything and abandoned it; it will be an annual event during the summer vacation. If you recall when we started the Abuja Film Festival in 2004, apart from the National Film Festival (Zuma), there were no film festivals, awards, or film markets but today, we have close to 15 different Nollywood events bothering on film festivals, awards, markets, etc. The point I am making is that Kids Alone will be an annual event and I foresee more of such reality shows. What was the experience like and what were the challenges? Interestingly, it's been a fulfilling project even though the challenges have always been in the area of sponsorship and funding of the programme. Apart from a couple of product supports from some companies, 100% of the production cost has been funded from my company, Fibiba Works Production, which was coined from the names of my children. We are optimistic that with time, we will get the required support to pull the project to our estimated height. Were parents receptive to the idea of their children staying all alone in a house for that long without their presence? That was the funny part of the show; we had over 270 children at the auditions, which lasted for four days and during those days, parents were always coming till the final selection was made. Then for four weeks, we had a pre-event orientation programme for the children, where they visited the National Theatre, cbaac, the Deputy Governor of Lagos State, Numetro and Galleria, Sosaco Nig. Ltd. (makers of Jago milk), Cway Nig. Ltd, among many others. During this period, we discovered the parents had more enthusiasm for the show and I must commend them. What do you think is the benefit of 'Kids Alone' to the children? As I said earlier, apart from filling the vacuum, Kids Alone is a reality show that borders on the intellectual abilities of the Nigerian child while inculcating good morals into our children and also integrating our culture and norms in our children. But above all, we expect to entertain our viewers through the children and also give the children a sense of belonging. How would you describe Temitope Duker? Temitope Duker is simply a wife, mother and media practitioner who is loving and caring. I am an introvert who cannot really point at a close friend but numerous acquaintances. I devote more of my time to creative things and my family. Also very homely, you will find me at home every weekend, apart from going to church on Sundays. I was actually born in Lagos and I grew up in Lagos. I am a Lagosian by birth, from the Benjamin family. My great grandfather, Mr. Bagann Benjamin, was one of the first set of newspaper publishers in Lagos. He was the founder of the Lagos Observer and was also a councillor in the old Lagos Town Council in 1926. He was also an architect. He designed the likes of the Holy Cross Cathedral, Christ Church Cathedral, Mosalasi Jimoh, all on the Island. I am from the famous Olowogbowo area of Lagos. I grew up in Lagos, attending my primary school at Ade Akodu Memorial Primary School at Ladipo Labinjo Crescent, Off Bode Thomas Road, Lagos and then, had my secondary education at Moremi High School and the University of Ife. I returned to Lagos to attend the Nigerian Institute of Journalism at Ogba and the prestigious Yaba College of Technology in Lagos, where I studied Book Publishing. I did my youth service as a teacher in Lagos. Prior to that, I was with NTA 7, Lagos, between 1996 and 1998, as an intern, before I joined my husband in running our media business. What was your initial career choice and is it the same career you are practising now? I have always been in the media business from the inception of my career; the only time I was away from practising in the media was when I went to serve and when I was carrying my third pregnancy. I was also a teacher for one year. All my life, I have had an interest in the media, that was why I studied Journalism, went to FRCN (Federal Radio Corporation of Nigeria) Training School and Yabatech to study Book Publishing. Funny enough, as a child, I wanted to be a dancer but it was a child fantasy. Why do you like being behind the scene, as against staying in front of the camera? It's more challenging being behind the camera; being in front of the camera is basically for 'show while being behind the camera is the real business which is what I have been doing. I have had the opportunity of being in front of the camera, when I was with the NTA; I was a reporter and I had the opportunity after my course at FRCN Training School of being a newscaster, but I felt that wasn't a part of me. Acting has never crossed my mind, because I could very well play lead in my husband's films, like some of our stars whose husbands are producers. I have also not regretted being a producer, writer and entertainment consultant all these years. If given another chance, I will remain behind the scene. Besides, I am a very private, reserved and maybe, a shy person. This is really my first major interview that I have granted; I can't even believe I'm talking because I try to avoid the timeligh. This has kept my business and family going and together. If you were not in entertainment and not married to a showbiz personality, what would you be doing? There's only a thin line between the media business, which is my training, and entertainment which is what I have combined to do, so what do you expect? I would have still been in the business of entertainment. Any regret towing this line? No. I have never regretted any day. If given another chance, I will do it again. How and when did you meet your husband? We met in school, at the Nigerian Institute of Journalism. What else do you have your hands in outside this children's programme? Apart from Kids Alone, I do entertainment consultancy for different projects. I also produce two television series titled IMAGES and ELDORADO, syndicated on 18 TV stations around the country, for FAD productions. Apart from Kids Alone, Fibiba Works is also into events management, which we have done for the inaugural ceremony of the present Governor of Bayelsa, Tinapa, Mnet, AMAA Awards, Face of Nollywood, Miss Tourism, Bayelsa, and several other organisations. Why don't we read about you and your fighting or quarreling on the pages of husband newspapers like others in the industry? We are introverts and we don't believe in glamorising the pages of newspapers with our issues. Besides, we met as friends and as friends, it is easier as we understand ourselves and respect our individual opinions. In as much as I sympathise with showbiz couples, whose scandals have graced the pages of soft sell magazines, when you look at it, you find out it's basically their fault, as they devote so much energy washing their dirty linen in public, the same way they do their unnecessary show off. For us, we feel our works should sell us, not our talking and flashing our pictures on pages of newspaper. How have you been able to manage work and motherhood? It's very tasking; sometime I wish I had more time for my children but the good thing is that they are growing up. My first daughter is 10 years and in Form 1, while the others are 9 and 7 (still in primary school), but I always make sure I don't allow our tight schedule to affect them, as I still have time to check their home work, go for PTA meetings (Parents-Teachers Association) and of course, take care of my husband, even though we have always worked together. We even share the same office as we share the bed. Will you encourage your children to go into entertainment? If that is their desire; I think one of them has an interest in arts. You cannot choose a profession for children of this generation because they are so independent-minded. Besides, I feel children should be allowed to make a career choice with guidance from their parents and not the parents imposing a career on the child. It might sound funny, red is my favourite colour. It brings out my colour, you know I am dark. What can you say are your likes and dislikes? For likes, I will say honesty, integrity and peace of mind and of course my dislike is failure. I hate the word failure, dishonesty and people who lack integrity. Christina Amanpor of CNN; I have always wanted to be a war correspondent but unfortunately I couldn't.